(1992) 13 tracks: Pretty Peg / New Ships A Sailing / The Birds Nest / The Man From Bundoran; Donal Agus Morag; King Of The Pipers; Seamus O' Shanahan's / Walking In Liffey Street; Mo Choill; The Snowy Path; Drowsy Maggie / Rakish Paddy / Harvest Storm; 'Si Do Mhaimeo I; McFarley's / Mill na Maidi; The Rosses Highlands; A Nobleman's Wedding; Bog An Lochain / Margaree Reel / The Humours of Westport; Dobbin's Flowery Vale. Riveting music that reaffirms and enlarges the international stature of the traditional band recognized as Ireland's best. Never complacent, Altan experiments with harmony and choral singing on such stirring songs in Irish as Donal Agus Morag, led by Mairead Ni Mhaonaigh's extraordinarily expressive voice. 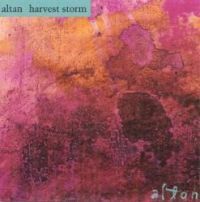 This album stamps Altan as a band whose vocal blend can fully match the mastery of their fiery instrumental playing. Ciaran Tourish joins, and the three fiddlers have never sounded tighter or more tenacious, while Frankie Kennedy again shows why he's among Ireland's most accomplished flutists.